Dear Indian Visitor ! This site is designed mostly for American visitors but along the way, I have collected various information which could be useful for Indian visitors. Thank you for your feed-back and suggestions : I hope some of them can help and this page is under construction. Welcome to Indian visitors and expats to France! Cher visiteur indien ! Ce site est conçu essentiellement pour des visiteurs américains mais en le rédigeant, il m'arrive de trouver des éléments qui peuvent être utiles à des indiens. Merci de vos réactions et suggestions : j'espère que certaines pourront rendre service et cette page est encore en construction. Bienvenue aux visteurs et expatriés indiens en France! Little India : the "Indian district" is in the North of Paris, near the Gare du Nord, around the Passage Brady (46 rue du Faubourg Saint Denis, ) : shops, restaurants, a Hinduist temple (Temple of Ganesh, 17 rue de Pajol), etc. ; there is also the Passage du Prado (12 rue du Faubourg Saint Denis). The only thing the French know is that France had started developing a strong relation with India but, after the Seven-Year War lost by France, in the Treaty of Paris (1763), France left India to be replaced by Great-Britain, keeping only five cities (Pondichery, Yanaon, Chandernagor, Karikal and Mahe) which were, of course, turned back to India in 1954 after its independence. A trading post had been established in Pondichery by the "Compagnie des Inds Orientales" in 1670. Remember that in France you can sleep in a real castle for the price of a hotel! 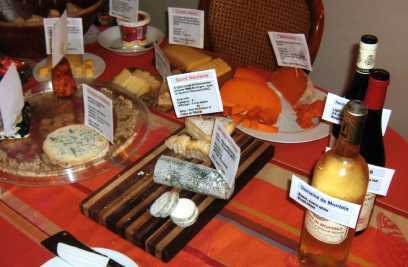 Do you know that France has more than 360 different sorts of cheeses ? Click to learn about it and enjoy a Wine & Cheese Tasting with author Harriet Welty Rochefort. Together or separately, Harriet and Philippe speak about Intercultural Differences : click here for information.